Myrtle Beach's Webster Works Worldwide project entailed volunteering with Treats for Special Kids at Medieval Times. Each year at Webster University campuses around the world, students, alumni, faculty and staff volunteer with agencies and projects that make a difference in their local communities. In South Carolina, where Webster has had campus locations for over 40 years, that entailed a variety of projects. At Webster's Myrtle Beach campus location, staff participated in Treats for Special Kids at Medieval Times. 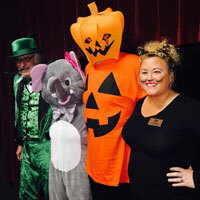 Held around Halloween -- and with costumes encouraged from volunteers too -- this event provides physically and mentally challenged children with the opportunity to collect treats in a barrier-free environment that is safe and fun for all. Attendees from Webster University included Myrtle Beach staff Tim Groza, director; Helen Harman, community relations coordinator; Chris Foy, office manager; and Kevin Foy, facility manager. Webster Columbia volunteers supported the EdVenture Community Garden project at Pine Grove Elementary. At the Columbia Metro Campus, faculty and staff volunteered in support of the EdVenture Community Garden project. 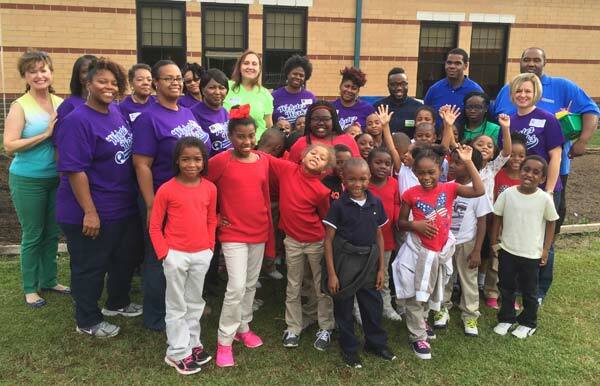 They reported to Pine Grove Elementary School, where EdVenture teaches afterschool programs, and worked with these students to do the fall re-planting of their community garden. Using the South Carolina Department of Agriculture’s School Gardens toolkit, volunteers from Webster and Club EdVenture students cultivated and planted vegetables in the garden and EdVenture staff provided educational programming. The Community Garden Program gives students the opportunity to learn healthy nutrition practices, healthy eating choices, and how to include fresh vegetables into their daily lives. Webster University also engaged with afterschool students in helping with homework.